God has a plan for your life. Make sure you seek to discover it daily! In the hustle and bustle of each day, its difficult to remember that God has an ultimate plan for our lives. Featuring devotions and scriptures from each book of the Bible, Being Still with God Every Day by Drs. Henry and Richard Blackaby will help readers intentionally seek the interactions God has with them on a daily basis. 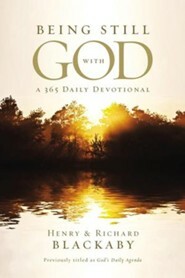 In this 366-day devotional, the Blackabys glean what Gods Word says about Him and how He wants us to live. From Genesis to Revelation, God reveals His plans for our lives. Each day features a scripture and a short, meaningful devotion to set minds and hearts on practical, godly living every day of the year. Previously published as Discovering Gods Daily Agenda. I'm the author/artist and I want to review Being Still With God Every Day - eBook.